Hanover Research was founded on a disruptive business model that is revolutionizing the market research industry. 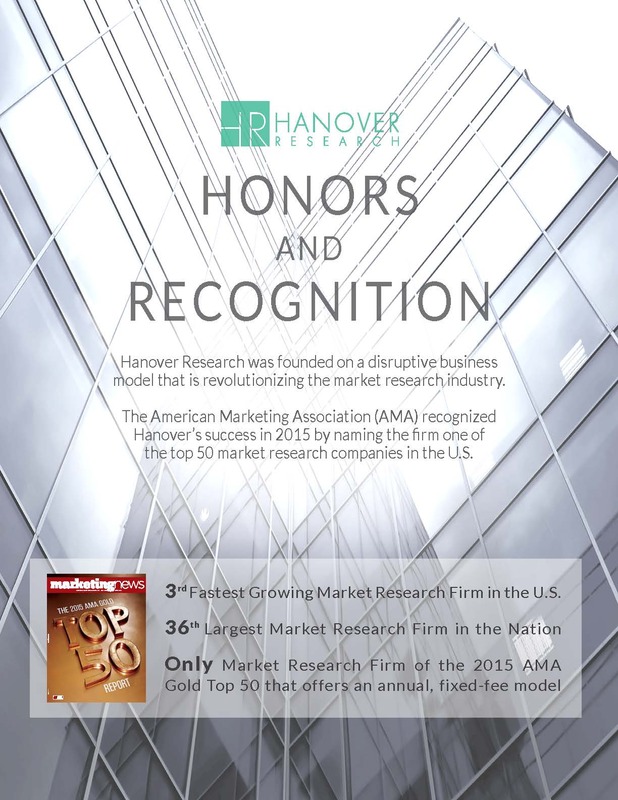 The American Marketing Association (AMA) recognized Hanover’s success in 2015 by naming the firm one of the top 50 market research companies in the U.S.
ARLINGTON, VA – The American Marketing Association (AMA) named Hanover Research as a top 50 market research firm in its 2015 AMA Gold Top 50 Report. Making its debut on the list, Hanover ranked #36 overall for revenue out of the 192 U.S.-based, for-profit market research companies considered for the report. Most notably, Hanover was the third fastest growing company, with 50% annual growth; the top 10 firms on the list grew on average only 3.4%. Hanover attributes its ability to capture market share at such a high rate to its unique positioning as the only firm that provides tailored research through an annual, fixed-fee model. Founded in 2003 and headquartered in Arlington, Virginia, Hanover has over 330 employees, including a high-caliber staff of researchers, survey experts, analysts, statisticians, and grant professionals. To learn how Hanover can help grow your business, please contact info@hanoverresearch.com. If you are interested in accelerating the development of your career by joining Hanover, please visit http://careers.hanoverresearch.com. Founded in 2003, Hanover Research is a global research and analytics firm that provides high quality, custom research through an annual, fixed-fee model for clients in the corporate, education, and healthcare sectors. Headquartered in Arlington, Virginia, Hanover employs high-caliber market researchers, analysts, and account professionals to deliver a robust service infrastructure that is revolutionary in its combination of flexibility and affordability. To learn more about Hanover Research, visit www.hanoverresearch.com. To download more information about Hanover’s Gold Top 50 Report Ranking, click here.